Like most tournaments and large-scale events, the Atlanta Tennis Championships presented by USTA Southern rely on the support of partners to make the event a great success. USTA Southern President Mike McNulty said, "Sponsoring the Atlanta Tennis Championships allows the USTA Southern Section to bring professional tennis along with grass roots tennis to Atlanta." USTA Southern is the presenting sponsor of the Atlanta Tennis Championships. 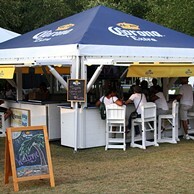 The Corona Beach house is a great place for spectators to cool off, listen to music and enjoy a cold Corona. The beach style atmosphere offers a stage with live music, a bar equipped with two televisions, and Corona beach chairs with cooling fans for spectators. They are serving four types of Corona beer and are giving away hats, shirts and wrist bands. Kay Willson, from Baton Rouge, La. said, "I’m just chillin’ and listening to some music while watching tennis with my friends." Wilson, the official ball of the Atlanta Tennis Championships, has a display booth in the Mall of Tennis. Fans can take a photograph while sitting on a Wilson tennis ball sofa. Enter for a chance to win a Wilson tennis racquet or a pair of Wilson Tour Vision tennis shoes. You can also enter for a chance to win a trip to New York City to help Mardy Fish and Wilson in their attempt at getting hundreds of people bouncing tennis ball and setting a Guinness world record. 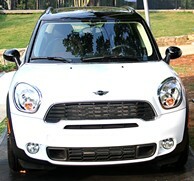 BMW is a returning partner for the Atlanta Tennis Championships. They have six cars on display, two MINIs and four BMWs. Stop by one of the display tents and sign up to test drive a car at one of the BMW dealerships. Once you test drive a car, you will receive a Roger Federer Wilson tennis bag. Shirts and gum are other items they are giving away. The Atlanta Tennis Championships will help the Southern Section showcase 10 and Under Tennis and its advantages. Courts have been set up to educate fans on the importance of smaller racquets, smaller courts, and low compression balls and how these tools help tennis grow among the youngest players in our section and country. Highlighting this program at the Atlanta Tennis Championships furthers the mission of USTA Southern, "To Promote and Develop the Growth of Tennis." As owner of the tournament, USTA Southern is proud to bring professional tennis back to Atlanta.